Among quintessential holiday experiences is ice-skating at the world-famous Rockefeller Center. What could make it even more special? 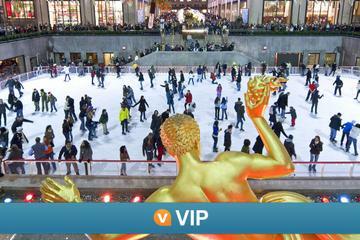 This VIP package allows you to revel in an iconic New York tradition with priority ice-skating entry, a heated indoor chalet and admission to Top of the Rock. The VIP chalet has all the bells and whistles: complimentary hot chocolates, freshly baked cookies, and a troupe of concierges ready to give tips for the ice as they help you put on your skates. Once you’re done at the rink, head to the Top of the Rock for unparalleled views of the decorated city below you. Splurge on yourself and loved ones with this memorable holiday treat.